I had started a post on my phone a couple of days ago, I ended up scrapping most of it after dealing with some life altering changes today. Here's what I learned from them... one, I have to stand my ground and live my life the way I want to live it, I am not going to be pushed/pulled into something because of someone else, no one controls me but me. Two, I am more than capable of making changes when I put my mind to it... Whenever I think I can't do something, I just have to read past posts, which reminds me that if I can lose 75+ pounds in under a year and survive losing 'him' at the same time... I am more than capable of dealing with some small life altering changes. I had lost my motivation for losing weight, or so I thought. I kept thinking I needed to be in more control and be more present in the present... Although I did not go overboard and eat the way that I used to over a year ago, I was definitely not as careful. I knew that I had gained some weight back as my clothes were fitting to a tee... where they had been loose. I reverted back to my old ways in that I didn't want to step on the scales. Tonight I finally hopped on and I found out that I had only gained a little less then 8 pounds over the past almost four months. I was so happy, so relieved and it motivated me. I am back mapping my walks whenever possible and putting my food in to My Fitness Pal. That last one is absolutely key for me. I am ALWAYS successful when I write down what I eat. This is what works for me, I need to be accountable to myself... that is why Weight Watchers worked for me when I attended years ago. 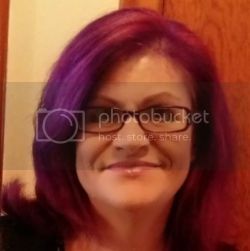 I was reading one of the blogs I follow awhile back (Grace Notes) and she wrote about a weight loss plan she was using. It was called IF, which stands for Intermittent Fasting. She was having great success with it and finally I Googled it last week and read up on it. I realized that this is what I had used to lose the weight without even realizing it. When I had the best weight loss success last year, it was because I was eating all my food in an 8 hour window each day (usually between 8am to 4pm)... this works for me. So last week I started it again and I feel amazing... as well I am exercising more. I know that this is not something that works for everyone, just like Paleo works for so many people but this would not work for me as I do not eat that amount of meat and it is difficult for me to digest it. However; this plan works so well for many people. I honestly think that we all have to figure out our way to get there, we are individuals with different needs. This reminds me that no matter how difficult life gets and how many curve balls are thrown my way, I can still eat healthy and not use that as an excuse to check out and gain all the weight back. I am not in a race to see how fast I can lose the most weight, I am in this for the long term, this is a life style change and I couldn't be more grateful for holding on to that when the past few months were quite chaotic. Having a chaotic life is not an excuse to just eat what I want, it is about dealing with life head on and continuing to grow. I have caught a glimpse of the path in the last few months, it took making me a priority and looking for ways to get back on track. It is so funny (strange) because I learn these great a ha lessons that I write about and then I think I have it... yet I seem to forget what I have learned. I will have to remind myself daily what got me to where I am today (and that is perfectly fine with me, whatever it takes to stay on track and brings me success). I admire you for your hard work and your consistent self control. Also you are an inspiration for a lot of your readers. The fact that you have decided to live your life the way you want to shows that you are not only confident, but that you are responsible enough to not be persuaded by others no matter how much they tempt you. Holding on to your grounds when you know that your right is always good. Estou bem! E você, Launna? Como está? O que importa é ter força de vontade para não se arrepender depois. Good for you doing what is right for you the way it is right for you! I really love that you don't let small bumps deter you from the bigger picture of your emotional and physical health. It's hard work to stay on track with dieting----I tend to eat when I'm stressed or even bored. I have put on weight this past year because I have been spending so much time on the computer doing this book---I haven't had time to exercise as much because I worry about meeting deadlines. But I also look for excuses to overeat. Not good. I admire your tenacity to stick with what you are doing. I wish I had your motivation and willpower! I am so glad you are showing where there is a will..there is a way..and so many possibilities. Its easy to stagnate..especially on a diet, but I think you think of it as a way of life..and that makes all the difference. Hope you have a wonderful weekend. At least, it is cooler here. I want to walk more when its cooler. I loved this post Launna. The sky is the limit and your proof of that. So proud of you sweety! And i'm happy to read that you find new motivation again, and move forward! Wish you a wonderful weekend! We all need to be reminded from time to time of our achievements in order to spur us on in meeting other challenges head on. You have definitely made some Incredible changes in your life so when you meet the next hurdle, it is good to remind yourself of how successful you have been. This all sounds so much more positive than before. You know yourself so well and can see that you are capable of so much. But, it all needs to be paced. We can all be overcome with the pace of change if we are not careful. So, keep being kind to yourself and try not to take on too much. You are right, there is really no excuse for not eating right. Too many people use their job/kids/busy lives/whatever as an excuse to eat badly. I'm really happy that you are strong and brave enough to admit that those things are NOT an excuse and that you can continue to live a healthy lifestyle no matter what. I enjoy IF as well! It combines really well with 'primal' eating (my personalized version I call NGNS-5, meaning No grains, no sugar, with 5% wiggle room.) IF works great with primal because the more protein and fat you eat, and the less sugar and grains, the easier it is to IF. If you want to read about primal, go to marksdailyapple.com, and click the 'start here' button. He has changed my life! So has Wheat Belly, and The End of Overeating. Today I fell in love with your quotes. You have inspired me (as always). I am so proud of you for your constant persistence! You are in control!!!! Just remember -- it is your journey and only you can drive! Ignore those backseat drivers. your posts are always so inspiring, love the last quote! You got moxie Launna.....stay strong. Daily reminders are always a good thing because it keeps you on track. You will get there, one day at a time. I was doing well! My fitness band keeps quitting on me...I'm trying to figure out what I've done wrong with it. But when it works right, it logs my steps and I can plug it into my phone occasionally and keep up with how many calories I've burned and enter the food I've eaten. I recommend the Fitbit Flex if someone's thinking about getting one. The one I got (Jawbone UP) is too buggy. Beautifully written. 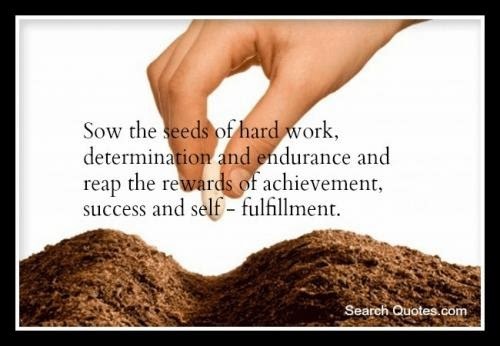 Hard work is the key to success indeed. I totally agree, do not allow anyone to control your life! I love the last quote: "I will have to remind myself daily what got me to where I am today (and that is perfectly fine with me, whatever it takes to stay on track and brings me success)". I definitely agree with you on this Launna! 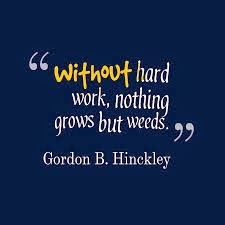 Hard Work does bear fruits and also makes us more accustomed to things I have come to believe! Thank you for yet another inspirational post and have a great weekend! have adhered to the principle of self-determination on its own is good, but not always what we think would actually true, sometimes we also need someone else to give encouragement. but back again at ourselves whether all of the opinion that we will do or we ignore, because life is not his own, but complement each other to achieve a better life yourself. I am really proud of you! It is so good that you work so hard for trying your goal. Change can be so hard, but it's the one constant in life, and I feel we thrive when we can embrace it. I think that's something we forget as we get older and comfortable. When we're teens, we're all about change and the challenges that come along with it. As adults we tend to forget, unless we make an effort otherwise. Here's to making our own destiny and becoming our ultimate selves! Hi Launna. Always love your hard work. Being ourself plus hard working it can us somewhere at least. - you're the one too Launna. I wish you all the best with what you are going or been doing and keep up with your hard work Launna. I'm there with you:). May your day and upcoming week is beautiful as you are. I am so happy for you! Glad to know that you've found a motivation. Hope you have an amazing brand new week! I admire your ability to bounce back and your will to be on the right track. I am very happy for you, all the best always. This is a wonderful post, Launna. You always inspire me. I'm going through a lot of ups and downs lately, too. The stress is getting to me. But it teaches me that it's not only important to be proud of us during the good times, for what we accomplished, but even more so during the bad times when we need to hear how proud we are of ourselves and how much we love ourselves, more than any other time. It's so amazing how you get yourself back on track. It's hard, but the right thingh to do to not be upset about 8 pounds but proud of yourself you're taking care of yourself again now. Ups and downs are a part of our lives and the more we roll with it and appreciate ourselves anyway the faster we'll be back to where we want to be :) Have a wonderful week, Launna. Big hug for you! Very inspiring words... perfect for my Monday morning. I just says hi to my friend this Monday morning and wishes a productive day to each other, but these words are very motivating, thank you for sharing! I'm so glad you have gone back to the IF, and are having success with it. And thank you for so faithfully commenting on my boring posts :-) whenever I get around to writing one. I wish you much success, Launna! Keep up the good work! I have been slacking on eating and working out lately because i have been out of town so much. I just got home from the grocery store and am ready to make great choices this week! I love reads like this, it opens my eye to everything i vaguely knew about. And this is indeed very inspirational. This is so wonderful and inspiring Launna! As you said everything you wana achieve in life in hard work and your effort and dedication, all together makes everything possible. I wish you get all you want and its good to see that you are taking steps in achieving your goals! Wish you lots of luck and love! Great article! You are so amazing and inspiring Launna! I wish you all the best and I know you will succeed. You have the power too achieve all your goals! I get what you said about losing motivation! I guess I have lost too but then I read this post and I'm gonna start working out too.. Thanks a bunch Launna for the inspiration!! Postagem maravilhosa arrasou tenha uma semana abençoada. I love this post. It shows you have to do things the way that fits or suits your lifestyle and you have to want change and adoptability for yourself. Nobody else can make you do anything you dont or shouldnt have to do. Thanks again for the lovely quotes dear Launna! Ah so you're hitting bumps along the way, but it's great to see that you're still rolling with it. You definitely have to figure out what works for you specifically when it comes to your eating lifestyle. There just isn't a one size fits all anything. But you'll be fine. Hope you have a wonderful week friend! Don't worry about the rough patches...just keep focused on the goal. What was that expression? Can't see the forest for the trees? Don't let a tree stop you. Just keep on walking through that forest! i think my comment did not post... but i just wanted to wish you goodluck on your goals.. and that i enjoy reading your introspective post...thanks for always taking the time to leave me sweet comments..
Ciao Launna, have a great day!!! Launna. I'm glad to hear you're havering a good time with Valentina. Yes my boys are loving going to school but the bad side of it, now my boys are again got a cold from their classmate. I'm about to relax and setting down after our time adjusted. You know how I feel again. Hope your day is bright and smooth than mine Launna. have a great eve dear! ho un debole per le borse Coccinelle, bellissime!!!! Ottime scelte, non ci deludi mai! I am really proud of you, Launna! I think writing down what you eat is a great idea, and so glad it helps you! Your posts are always thought provoking and encouraging. Thank you so much for keeps us prayer Launna. I'm now blogging with my phone and sitting in next to my poor boys during mid of the night. They've been coughing so much lately. I just cannot lay my head down but sit here watching them. Every time when they sick - it's scares me to dead because I know double troubles like people said and then I ended up sick after them. So inspiring post sweet Launna, I'm so proud of you! Thanks a bunches for your kind words! I probably need to take care myself this week instead of blogging. Have a wonderful present night Launna. 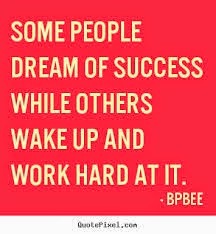 I like the quote about success. Great quote for kids. We need to work hard to get results. I agree with you with the hard work you can achieve more things. Have a great day Launna! Me decepcionei muito com aquele produto. Mas paciência, né?! launna - you're beautiful. keep up the great work. At one time in my life, I literally worked 60 hour weeks, and loved it, because it was important for me to get to that next step. I did, then I was listless for a while, not knowwing what I wanted to do. It's only been within the past 3 years, that I've zeroed in on it, and I'm working hard to make it work. I don't mind admitting that it's rough, but nothing worthwhile falls in our laps like that. We've got to put in the work. Like you, I'm also trying to focus on eating better and exercising because I think it correlates with how we feel about ourselves through the transition. I appreciate your diligence, and gives me hope to keep it goong. Hope your Friday is as fab as you.